The budget documents contain the budget positions which can be called up by the users in all InLoox PM projects on the budget page. The budget positions can be edited or deleted in the InLoox PM options as required. 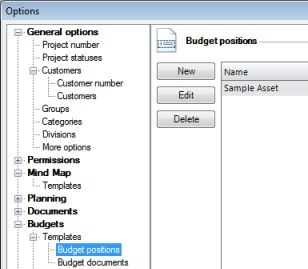 How to edit budget positions in templates in InLoox PM 7 • Copyright 1999-2019 © InLoox, Inc. All rights reserved.